The police top bras promise unbiased probe into the incident. 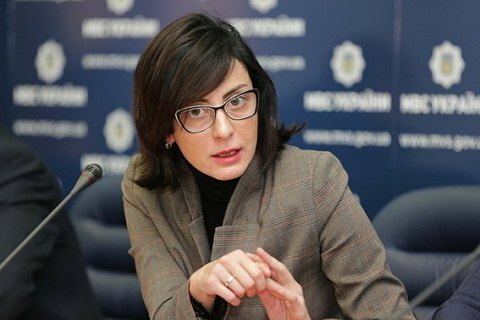 The police unit in Kryve Ozero, Mykolayiv Region has been disbanded following a deadly incident involving local officers, the head of the National Police of Ukraine, Khatia Dekanoidze, has said on Facebook. The head of a Mykolayiv patrol police company, Oleksandr Horpynych, was put in charge of public order in the town. Interior Minister Arsen Avakov confirmed the reshuffle. "As regards the events in Kryve Ozero, Mykolayiv Region. The district department will be disbanded and fully replaced. There will be changes to the command of the Mykolayiv regional police office. A new head of the regional police will be introduced today. All those involved in criminal or illegal actions will face trial and no attempt will be made to clear 'the dignity of the suit'. An investigation by the Prosecutor-General's Office, the Internal Investigation of the National Police and court, I am sure, will be able to establish all circumstances of the person's death in a QUICK and unbiased manner and to punish those guilty," he said. A 32-year-old local resident, Oleksandr Tsukerman, was killed in Kryve Ozero in the early hours of 24 August. According to the police account, his wife called the local station and said her husband was enraged and crushing everything. A police team arrived. It turned out later that a local taxi driver also complained to police about Tsukerman who allegedly robbed him and smashes his car. The police officers were luring Tsukerman out of the house but he refused to come out. An hour later he came out armed with a spade and attacked the police. They had to use force, including special means. According to the forensic conclusions, he succumbed to gun wounds. On 24 August, media reported that six police officers were detained but next morning Prosecutor-General Yuriy Lutsenko said that there were three officers detained.